D-et® is a registered trademark of delicious and safe virtually no-calorie sweetener. 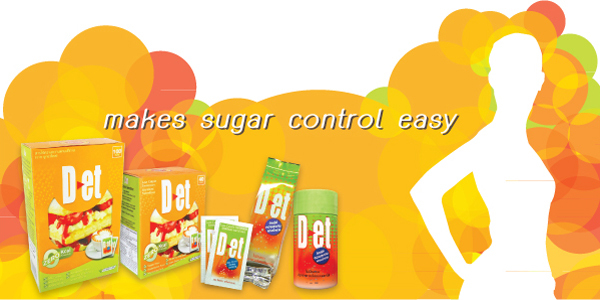 D-et® is a new sweetener made of SUCRALOSE as the main sweetening agent. Sucralose is the only no-calorie sweetener made from sugar and is converted into an indigestible form. Sucralose then has a pleasant sweet taste with no bitter aftertaste. Sucralose is approved for human consumption by WHO, FAO, and FDA in more than 60 countries. Sucralose, an easily-soluble white crystalline powder, can be cooked at high temperature. Sucralose is suitable for health-conscious, calorie-conscious, and diabetics. It does not generate tooth decay. D-et® is a blend of sucralose and erythritol. can be cooked at high temperature. D-et® is available in 3 types of packing. 1. D-et® Shaker, packed in a 10-cm-height plastic container with flip caps as a part of table condiments. Two shakes sweetens like one teaspoon of sugar. One shaker is equivalent to the sweetness of sugar about 200 teaspoons. 2. D-et® Sachet, packed in a single-serving paper sachet for ease of use. One sachet sweetens like 2 teaspoons of sugar. 3. D-et® Bag, packed in a plastic bag for bulk cooking; in hospital services, in home-made recipes etc. 1/4 teaspoon sweetens like 2 teaspoons of sugar.